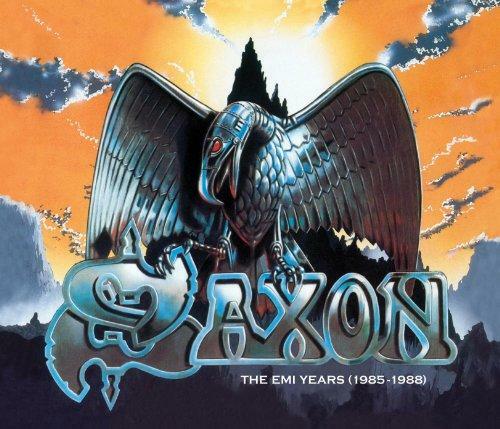 Saxon - "The EMI Years (1985-1988)"
After the “Carrere Years”, SAXON now release a collection of their work with EMI. SAXON, who are pioneers of the “New Wave Of British Heavy Metal” (NWOBHM), will release “The EMI Years” on June 1st. 2012. The 4 CD pack will include the three albums the quintet around Biff Byford released between 1985 and 1989, “Innocence Is No Excuse”, “Rock The Nations” and “Destiny”. All three albums include bonus-material, single-versions, maxi-mixes and/or live-titles. To round up the package, SAXON include a whole BBC-concert, recorded at the “Hammersmith Odeon” in London 1985. It includes classics such as “Wheels Of Steel”, “Strong Arm Of The Law” or “747 (Strangers In The Night)”.